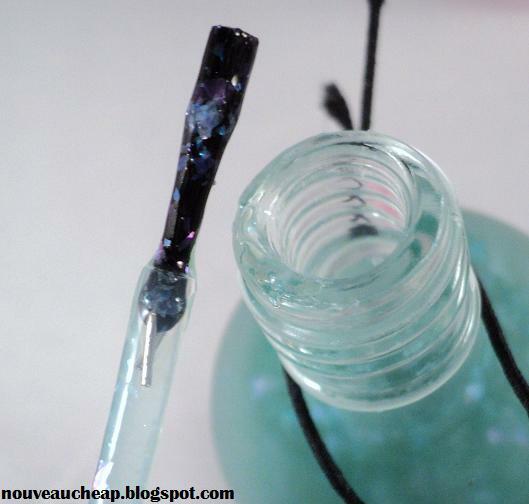 In the world of nail polish, rarely does a new product come along that 1) is a time-saving solution and 2) produces a really cool effect on the nail. 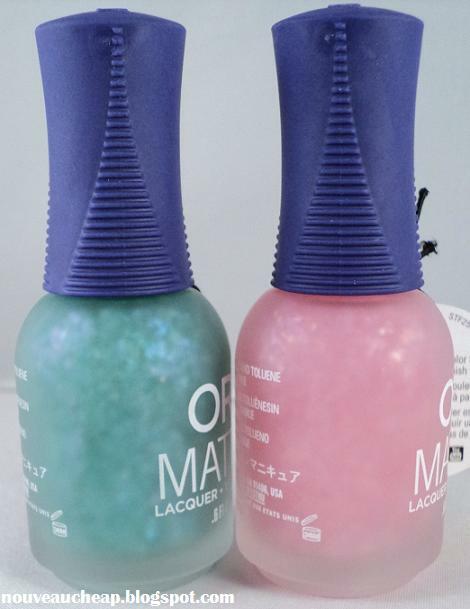 When I spotted the new Orly Matte FX Flakie Top Coats at a local beauty supply last week, I immediately though that these might actually do both (save time and look really darned cool on the nail). So naturally I bought them both, to find out for myself! NOTE: As of the time of this post, the Matte FX collection is now available on the Sally Beauty website. There are four polishes total in the collection. 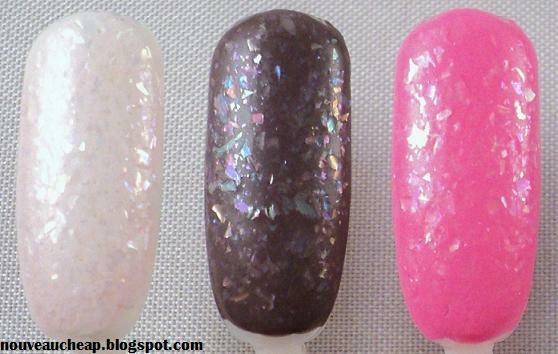 The other two are Iron Butterfly (matte multi-chrome) and Purple Velvet (matte purple). My local beauty supply only had the Green Flakie Top Coat and the Pink Flakie Top Coat, but I will definitely review Iron Butterfly and Purple Velvet when I get my hands on them. I want to point out here that the flakies in these two polishes are definitely different. Sometimes brands will take the same flakies and simply change the tinted base color (which is usually quite clear and doesn’t really deposit any color on the nail). So you can buy three different flakie polishes from the same collection and end up with identical results from each polish. 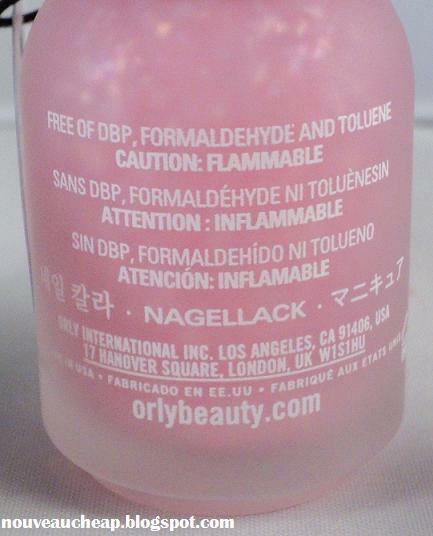 I hate it when that happens, so I just want to be sure you know that this is NOT the case with these Orly polishes. 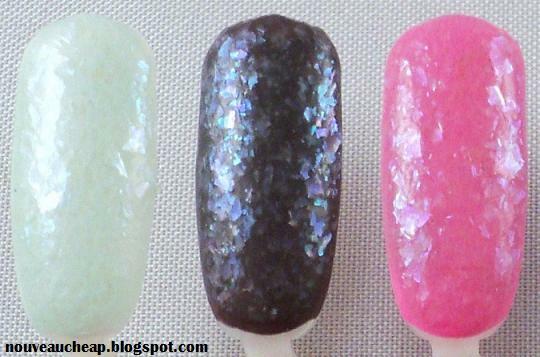 The flakies are noticeably different in both shades. 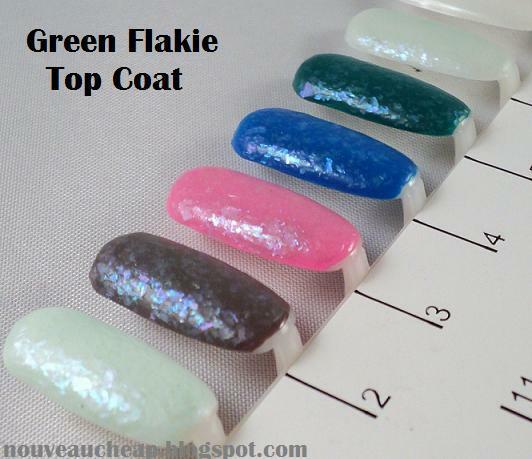 Notice how the Green Flakie Top Coat products a slightly more murky effect, while the Pink Flakie Top Coat gives a slightly more crisp effect. 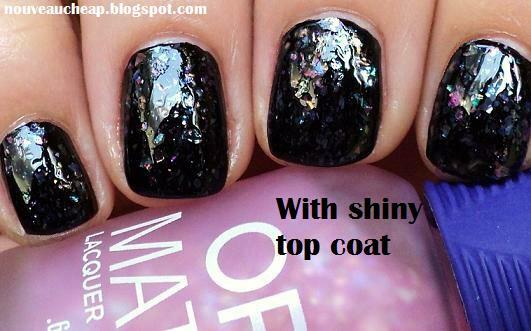 Application: Extremely easy for both polishes. 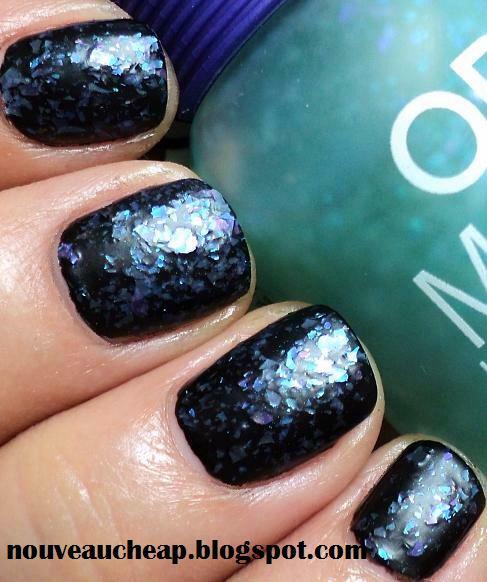 No fishing for glitter required. 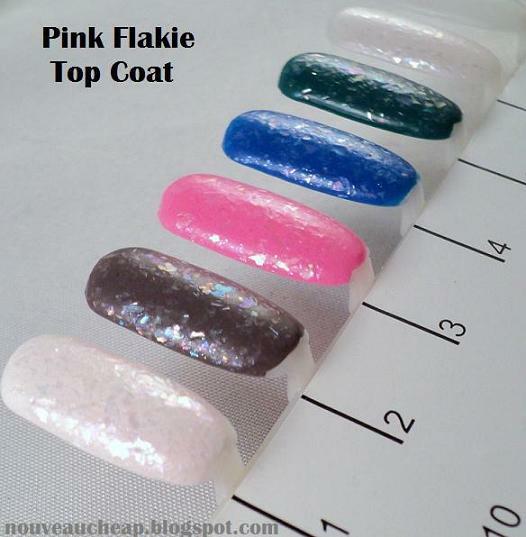 You can paint these on your nails just like any standard non-glitter polish and not have to worry about “dabbing” glitter on the nail for placement. 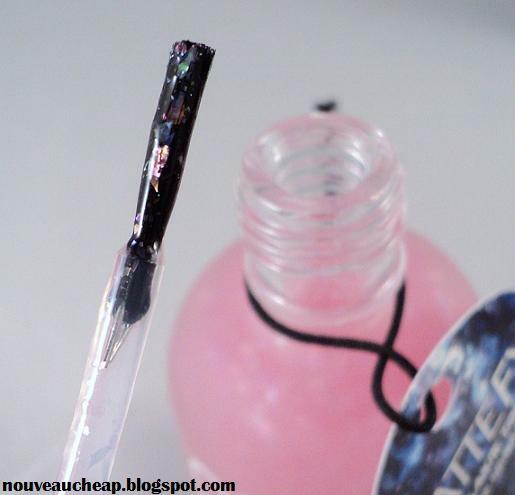 The brush picks up plenty of flakies and deposits them easily. 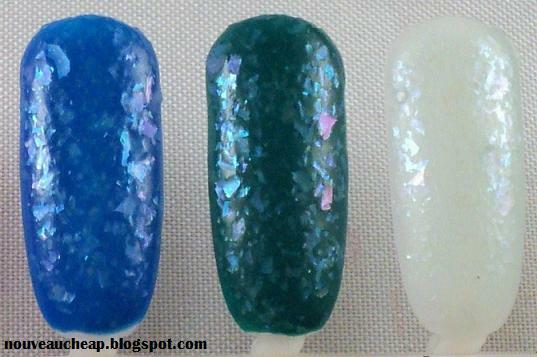 Consistency: The base polish in both shades is a tiny bit on the thick side, but certainly not horrible or frustrating. I was hoping these wouldn’t be goopy and heavy on the nail and they are not. 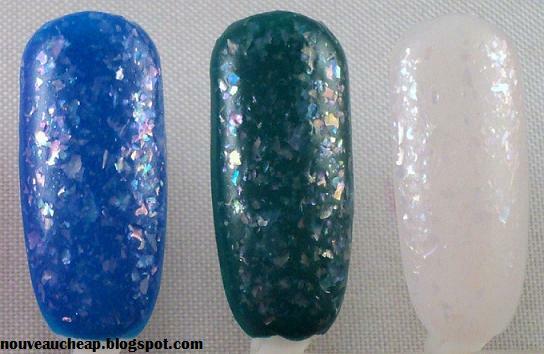 Flakie Factor: As I mentioned earlier, the flakies in each polish are definitely different from one another. 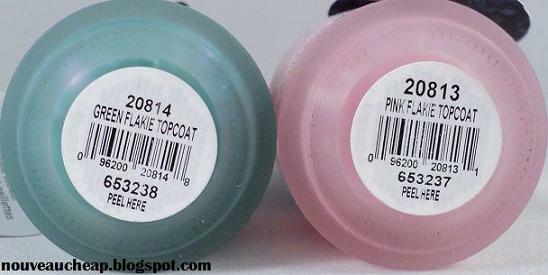 The green polish contains blue-based flakies and the pink polish contains multi-colored flakies. Also, the flakies themselves are nowhere near as large, jagged and angular as the Revlon Moon Candy polishes. 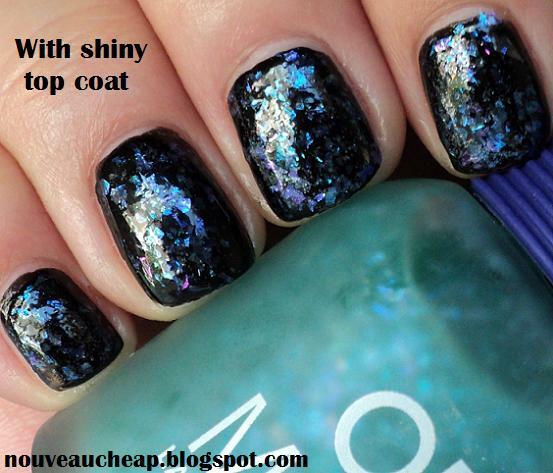 They’re also not as thin as the flakies in the original Sally Hansen Hidden Treasure. Also, I think it’s pretty apparent looking at my photos that the flakies in the green polish are a bit bigger and more abundant than the flakies in the pink polish. 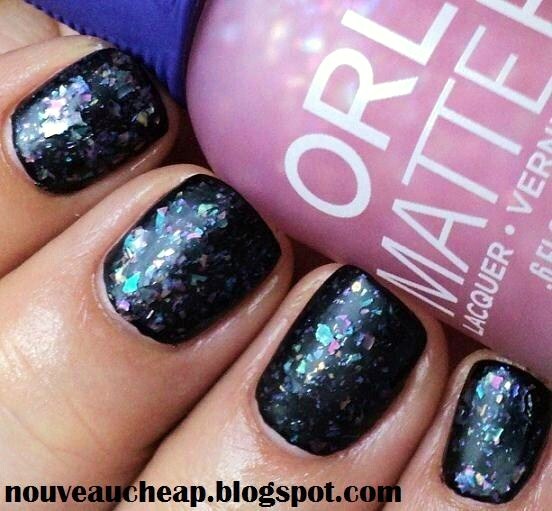 Finish: The flakies in these polishes lay flatly on the nail, with no rough, jagged edges poking up. When the polish dries, the surface of the nail is actually quite smooth to the touch. I know that, in extreme close-up, the finish looks bumpy but to the naked eye, the bumpiness is not as noticeable. Yes, it does look a little bit bumpy when viewed from a regular distance, but it’s not something that drives me crazy when I look at my nails. But if you’re the type of person who favors a completely smooth nail surface at all times, I’m thinking that you could apply a regular, clear matte top coat to these polishes to eliminate the surface bumps (but seriously, if you were to see these in person, you’d probably agree with me that they’re just fine on their own). Dry Time: No shocker here–these are dry to the touch in a minute or two. 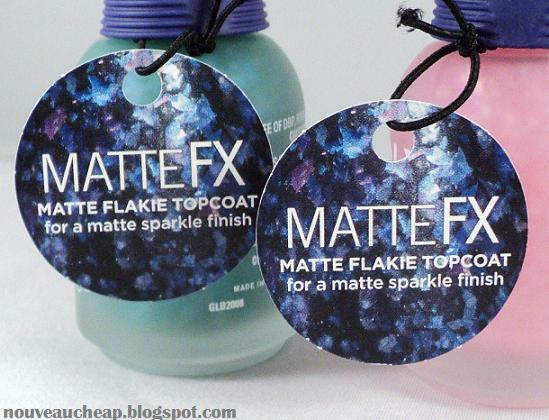 But I do want to warn you that you need to allow your base color to completely dry before applying either of these matte flakie top coats. I was impatient with a few nails and experienced smudging originating from below the surface on a few nails, so just a warning. Wear Time: Unfortunately, I can’t speak to wear-time since I have only had these for a week and haven’t worn either shade for more than a day at a time. For what it’s worth, after a day’s wear (on top of a base color) I didn’t have any chips or tip-wear. Removal: These remove like standard glitter polishes (i.e., they’re a little stubborn). I advise using the foil method or something like the Target Dip-It. I used the Target Dip-It and had no issues. FINAL VERDICT: Congrats to Orly for giving us nail fanatics something that saves time and looks really neat on the nail. 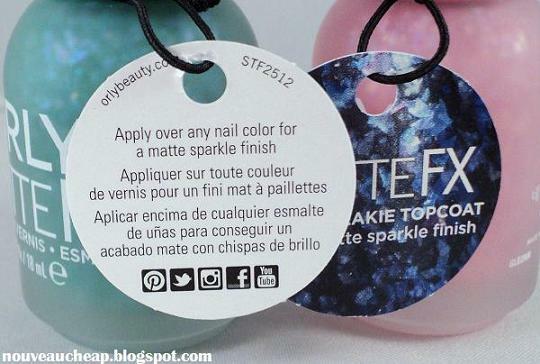 If you have ever wanted to do a “mattified flakie” manicure but hate the thought of applying multiple coats of polish, I definitely think these are worth checking out because all you have to do is apply a base color, top it with this polish and you’re done! The overall effect kind of looks like frosty, prismatic ice chunks on the nail, and I literally could not stop staring at my nails the entire time I was wearing these polishes. Yes, the surface looks a little bumpy, but keep in mind that my photos are extreme close-ups. To the naked eye, these don’t look that bump and the flakies lie very flatly on the nail, with no rough edges sticking up. I appreciate that these polishes are extremely easy to work with (no fishing required) and dry in a snap. What’s not to love about a product that can save you time and give you a fun end-result? Just a reminder: see the top of my post for availability and a look at the other two polishes in the Matte FX line. I would imagine that, in the coming weeks, these will be available at most retailers that carry the full line of Orly products. Embrace femininity with a color palette that is delicate, dreamy and sweet. The time has come to applaud approachable beauty with Blush, the new Spring 2014 color collection from ORLY. Nails take cues from cosmetics – a windblown flush or glossy lip inspires pretty lacquered fingertips. Blush invites you to fall in love with natural beauty that is tender, feminine and altogether genuine. All ORLY Nail Lacquers including the Blush Collection are formulated without DBP, Toluene and all traces of Formaldehyde and Formaldehyde Resin.